Our assessment of today’s United-Arsenal games among other recent fixtures. 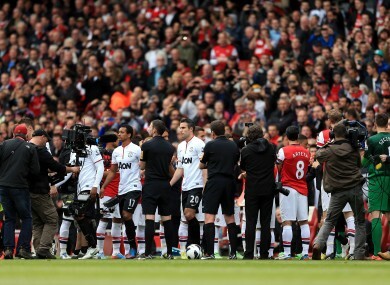 Arsenal players form a guard of honour for Premier League Champions Manchester United. Probably more so than any other side, Liverpool have been unfairly described as ‘a one man team’. As spectacular as Luis Suarez’s performances have been, such claims are hugely disrespectful to his teammates. Yesterday’s performance against Newcastle consolidated this point, as they secured an incredibly impressive 6-0 win. Indeed, Daniel Sturridge’s accomplished display, in which he notched a brace, indicates there is life after Suarez, should the unthinkable occur and the Uruguayan leave the club in the summer. Arsenal have a fairly poor record against Alex Ferguson’s men in recent times, and not many people would have tipped them for a victory prior to today’s game. Nevertheless, on reflection, they may well regard the match as two points dropped, with United playing in the type of lax manner you would expect from a team that has already secured the league title. While United gave an improved second-half display, they were so inept in the first period that had Arsenal attacked with more conviction, they could have been out of sight by half-time. While they’re still in a strong position to gain a Champions League place, owing to the ease of their upcoming fixtures, a win would have almost alleviated any doubt as to the likelihood of their finishing in the top four. There have been several seasons in the Premier League, most notably when Sheffield United fell victim to a Carlos Tevez-inspired West Ham, where certain teams could feel somewhat aggrieved to be relegated. However, on today’s evidence, it’s surely not the case for either QPR or Reading. The two teams played out an uninspired, error-ridden 0-0 draw that comfirmed their respective departures from the top flight, with both sides consistently illustrating precisely why they are struggling. Moreover, reports today that QPR are suffering from a lack of morale are hardly a surprise – their tendency to punch above their weight against teams such as City and Chelsea showed they had the talent to stay up. However, their perpetual inconsistency, presumably created by the poor attitudes that permeate the club, was surely one of the primary reasons for their failure. As most Chelsea fans will tell you, Frank Lampard hasn’t exactly been treated impeccably in recent months. Not playing a club legend is one thing, but failing to extend his contract despite another relatively impressive season in which he has managed 13 goals is another. Granted, he may not be quite the silky midfielder with immense technical ability that Roman Abramovich seemingly favours, but surely he could at the very least represent a useful alternative off the bench if plan A fails, a la Scholes or Giggs at United. And his persistent refusal to let his standards drop despite entering the twilight of his career was again evident today, as he scored one goal and created another in his side’s 2-0 defeat of Swansea, taking his total Chelsea tally to 201 goals in the process. Arsenal’s draw with United today ostensibly makes life increasingly difficult for them as regards their top-four aspirations. However, it may ultimately prove a valuable point, despite the fact that it leaves them just two points ahead of Tottenham, who have a game in hand. While they are currently in a tenuous position, they undoubtedly have the easiest run-in of the three sides, while Chelsea still have to play both Tottenham and United. Indeed, it would be a surprise if they failed to pick up maximum points in their remaining games against QPR, Wigan and Newcastle – a feat that would virtually guarantee them Champions League football. Consequently, Tottenham’s draw with Wigan yesterday could ultimately prove costly, and their match with Chelsea is looking increasingly like a must-win encounter.